And I was playing bridge out on the lanai with a raspberry lemonade, the same one that Jane Pauley drinks, and I suddenly remembered that my sister Gloria was visiting, my memories are getting worse since the last few blackouts and I pop three pills of estrogen and chase it down with a shot of whiskey to stand up and get the door which I’ve just realized someone’s been ringing for the last ten minutes, it’s Gloria and she’s wearing a Liz Claiborne dress, a Fendi purse, Benneton vest, Calvin Klein Hose, Tiffany necklace, Elizabeth Arden foot cream, Cover Girl eyeliner and Chantilly cologne and she is suddenly kissing the air near my cheek and I am expressing something that I think is joy. She’s brought presents for everyone and she gets me a gift certificate for a makeover at Elizabeth Arden and my mother tells me don’t expect a miracle and secretly I wonder if Gloria has had surgery or if money just makes your skin age more slowly and then I black out again. we’re sitting with my mother, Blanche and Rose and Blanche is talking about how she fucked a clown and Rose is wearing a Talbot’s dress, Marshall’s hose and drinking cranberry cocktail with a splash of V8 and we’re talking about how Blanche has fucked the director of the community theater who is like a really big deal for a part in Macbeth and I ask her about the play to appear interested but really I’m thinking about how much I’d love to slit Rose’s throat and apply the blood like rouge. Later, I pass out and tear my Hermes scarf into as many tiny pieces as I can and then set them on fire and my mother comes home with Gloria wearing a Sears dress with a Lens Crafters glass and she tells me that she’s going to live with Gloria in California and I wish I could show emotion but I took about sixteen Valium with my lunch of vodka poured over Metamucil. Then Blanche comes in saying she didn’t get the part in the play and I ask her again about Shakespeare’s creative process to keep her talking while I try to think about life with my mother. Rose starts telling a story about her perfect father on the farm and I ask her if her father is Michael Landon and I laugh maniacally and it’s the first time I’ve laughed in three years. Later Gloria is getting ready for bed in my room and I try to remember the thread count of the sheets so I can tell her and she asks if I am jealous of everything she has but then she tells me she hats her life and doesn’t know how much longer she can spend her money to find happiness and ever since her husband died she’s felt alone and the more emotional I get the more my head hurts so I put my frilly nightgown over my head and hide in there a while during Gloria’s dialogue about her late husband and then I go to mother’s room where she tells me she’s staying because she’s needed here. All this emotion has made me tired and I’m concerned that Blanche’s nightgown is Balenciaga and mine is only Ralph Lauren so I take another six Valium and finally fall asleep and dream about diamond studded playing cards that bleed real blood. I’ll think about it in the morning. We’re on a string of sub-par episode it seems, I’m also not thrilled with the guest star episodes. 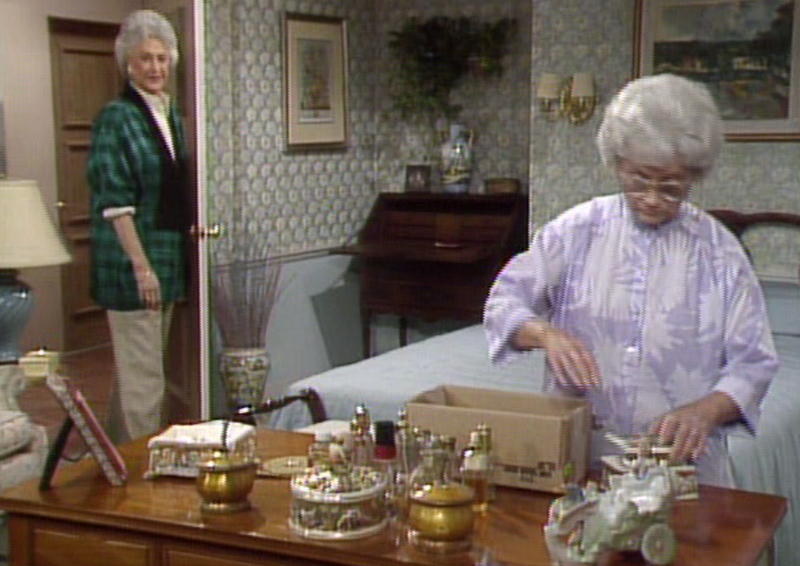 Dorothy’s rich sister Gloria visits, and asks Sophia to come live with her in California. Sophia passively aggressively accepts, because Dorothy has been annoyed with her [for pressuring Dorothy to date more.] 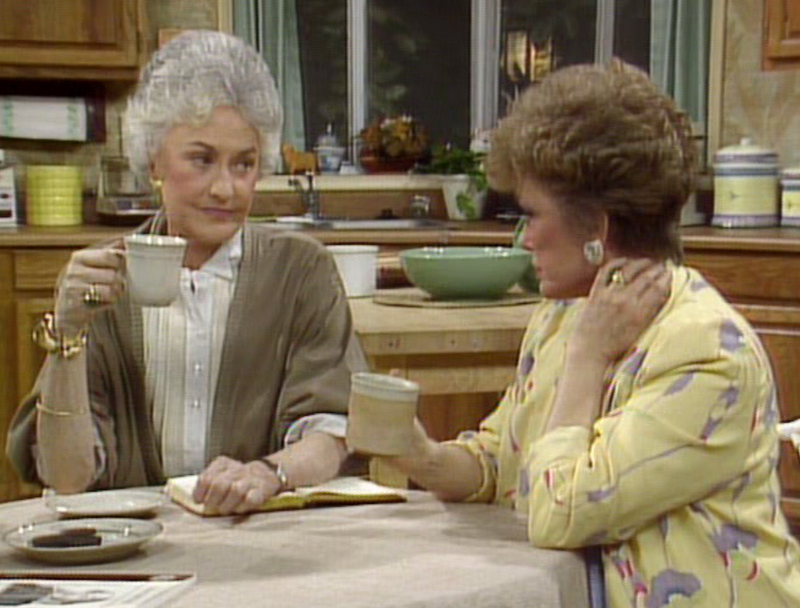 Seriously, if Dorothy dated any more, she’d be…Blanche. Best accent: Love how Blanche says Macbeth: sounds like Maaaake-baaayyyythe. Blanche Loves the C*ck Moment: She really did bang a clown. And the community theater director. And she never wears underwear. Annoying Guest Star: Gloria straight up asks Dorothy if she’s jealous that she [Gloria] married rich, has servants, great clothes, etc.? Dorothy’s all, no, my life is pretty rad here. Yea it is! If she has everything, why does she also need to steal Sophia away from her? Rose is a f*cking moron moment: Rose had an imaginary friend but didn’t know her name. Sophia is a crazy old lady, am I right? She gives presents to everyone, showing them she is happy she is staying with them, but it’s actually stuff she stole from the. It’s okay, it’s the stroke making her crazy! Hahaha strokes are funny! Perfect Bret Easton Ellis! lol!